Fort Worth, DR Horton, and LGI....come get your runoff stormwater....we don't want it! This is a current view of our backyard and every rain just adds to this body of water. This water isn't going anywhere either until it's pumped out or evaporates. This is a view of our backyard under normal conditions. 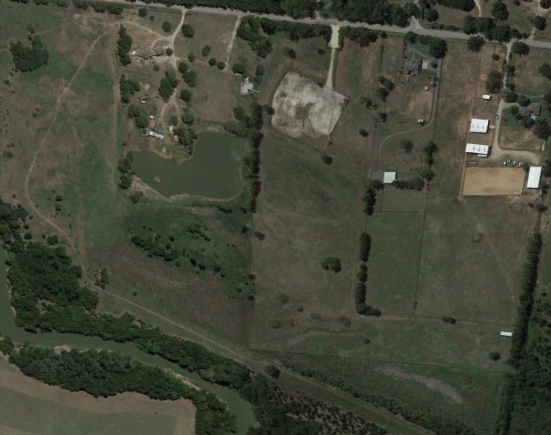 Part of our property is in flood plain and we expect it to flood when the Trinity River gets out of its banks. 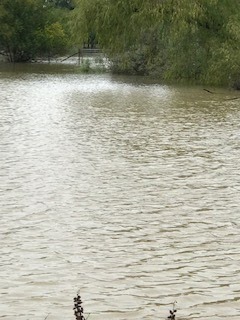 The river didn't get out though....this is just from runoff from the construction of the 50-acre DR Horton and 100-acre LGI housing developments uphill from us. And yes, the City of Fort Worth permitted this. Where did the City of Fort Worth's engineers think the runoff from these 150 acres, stripped of hundreds of hundreds of years old oak and pecan trees, located on a hill above us would go? Well, we asked the City of Fort Worth's engineers this, and believe it or not, they told us what we all already know.....the water is going to run downhill. When we asked the City of Fort Worth's engineers why they would permit a project knowing all of that water would be diverted onto the properties downhill, they told us that current code only requires them to consider the velocity of the water coming from a project and that they are not required to look at the volume of the water to be diverted to the property owners downhill. So, now we know one of the main reasons areas of Fort Worth which historically did not flood are now flooding. We also know our infrastructure is inadequate and the City of Fort Worth has no money to fix it, but the City of Fort Worth sure can prevent more flooding by simply requiring engineers to consider volume of runoff when permitting new development. 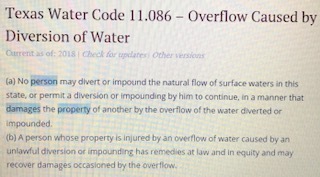 It's an easy fix City of Fort Worth, and would be much less expensive than a class-action lawsuit from the growing number of Fort Worth property owners devastated by flooding simply because a code needs updating. 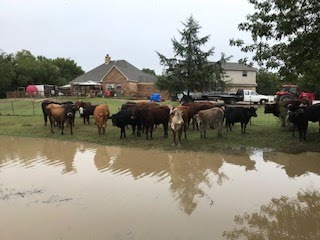 And please, City of Fort Worth, stop patronizing us by continuing to pay Freese & Nichols big money to write reports about why Fort Worth floods and how to fix it! The City of Fort Worth has been doing this since at least 2006 yet flooding is worse than ever. Stop the endless talk and meetings about flooding and do something about it already! And another thing, stop encouraging us to buy flood insurance for properties that didn't flood until the City of Fort Worth permitted construction which now causes our properties to flood! Maybe the City of Fort Worth should pay for our flood insurance if it's going to place our properties in jeopardy of flooding! Maybe FEMA needs to check out Fort Worth's flood management practices! 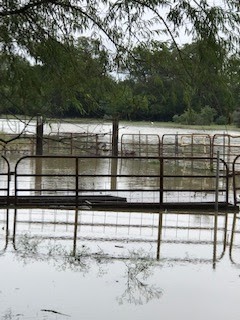 So, while we wait for the City of Fort Worth, DR Horton, and LGI to come get their runoff from our property, here are pictures of just some of the damages being caused to our property due to the City of Fort Worth's permit to allow and DR Horton's and LGI's diversion of the natural flow of surface waters. The barn is now on a peninsula. 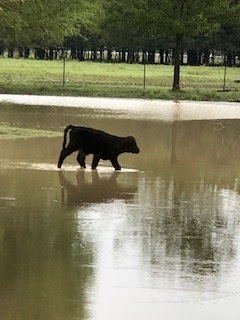 Calf has to swim to get to its mother. Who's Drinking Panther Island Kool-Aid? Campaign finance reports are very informative. The report identifies people/groups who support, and usually have something to benefit from, certain political moves. In this case, click on the link below to see who has something to gain from the Panther Island project. Not surprising really...mostly elected officials, engineers, and real estate developers. Fort Worth Bonds....We Are Being Played the Fort Worth Way! I'm voting NO to all of the propositions and here's why. Look at the sample ballot. Who in their right mind is NOT going to vote for streets improvements, park improvements, public library improvements, fire station improvements, animal shelter improvements, police facility improvements, and flood control and drainage?! But how do we know that's what we're actually getting? Does anyone ever read the proposition in its entirety? And that, my friends, is just what our politicians are banking on....literally....the un-informed voter. And I have to admit I resemble that remark....but not this time! I have done my homework! It was the Tarrant Regional Water District proposition that made me ask questions. As a victim of frequent flooding in Fort Worth, I was thrilled to see flood control and drainage on the ballot. I asked which areas would be receiving flood control and drainage improvements and learned none of the areas that currently flood will be receiving any type of flood control. I was informed the $250 million was for the area known as Panther Island which hasn't flooded since 1949. So, why are we being asked to support a $250 million bond for a flood control project for an area that doesn't even flood? Because our elected officials know we wouldn't knowingly vote to spend $250 million for an economic development project that benefits a select group of local citizens. And just who is this select group of local citizens? 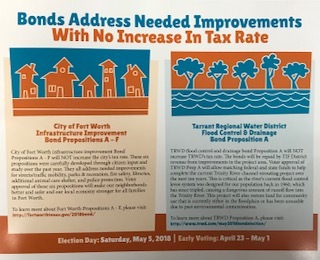 The answer lies in the fancy political propoganda most of in Fort Worth recently received from the Our Community Our Future group promoting the upcoming Fort Worth and Tarrant Regional Water District (TRWD) bonds. The Our Community Our Future group is none other than the usual Fort Worth Way Good Old Boys and Girls.....Mayor Betsy Price, the Fort Worth Chamber, TRWD Board Member Marty Leonard, and last but not least, Hon. Mike Moncrief. They've been able to raise close to $400,000 to con us into voting for hundreds of millions of dollars in bonds for "improvements" which may not actually be what they claim to be. I'm going to bet US Rep. Kay Granger donated too but I won't be able to confirm this until Texas Ethics Commission publishes their report on Monday. So....what's in it for them? Let's make the connections. Mayor Betsy Price actually wasn't a Panther Island supporter or at least that's what she told voters when she ran for election in 2011. It's doubtful she has anything financial to gain from Panther Island.....she just does what US Rep. Kay Granger tells her to do. TRWD Board Member Marty Leonard's family owns property from the northwest bank of the Trinity River to downtown. I still love Marty Leonard though, she's a class act and I don't think she has a mean bone in her body...I think she's just been brainwashed by her lifelong friends. Hon. Mike Moncrief was Mayor of Fort Worth from 2003 to 2011. He is suspected to be one of the dons of Panther Island. It's believed Mike's motivation is as simple as Bruce Springsteen's Glory Days. 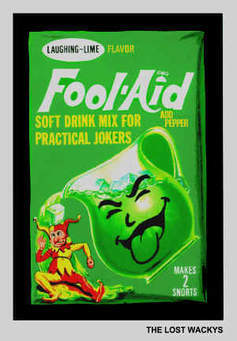 US Rep. Kay Granger has been using her position for personal gain for decades. She secured millions in federal funds in the late 1990s to build a commuter rail from Fort Worth to Dallas after purchasing an old building across from the now Intermodal Transportation Center. There was no consequence for that so why not do it again?! This time she secured more than $50 million for the Panther Island project, then bought a condominium about 1/2 mile from the project with her son JD Granger who just coincidentally is the executive director of the Panther Island project and earns a yearly salary of almost $200,000 despite having no experience in this field (which is probably the reason the project is way over budget and way behind in progress). Our Community Our Future......evidently it's about theirs not ours! Vote NO on all of these propositions! How many voters actually read a proposed proposition from start to finish? I think most voters probably take for granted that the blip we read on our ballots accurately reflects the true use for the money. Well...so much for that! I think whoever writes those blips are banking (pun intended) on our trust in their leadership and our ultimate ignorance. These people should be prosecuted for misrepresenting the voters. 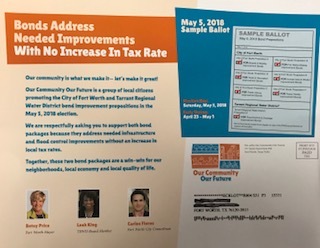 The ballot in the picture was recently mailed out in anticipation of the vote on May 5th. The proposition is from the Tarrant Regional Water District and claims to be for flood control and drainage facilities. Please refer to the link below which documents that the Tarrant Regional Water District needs the money to fund the Panther Island project north of downtown....AKA Trinity River Vision (TRV), the project is a proposed 800 acres of economic development in downtown Fort Worth. Why doesn't the ballot blip reflect this? How many voters will be hoodwinked and vote yes to the $250 million thinking they're actually getting flood control and drainage facilities from the Tarrant Regional Water District (TRWD) for this money?! By the way, this isn't the first time voters in Fort Worth have been duped by these ballot blips relative to Panther Island/Trinity River Vision (TRV). We were tricked in 2004 when we voted for a $232 million proposition for street and sewer improvements when the fine print indicated it was actually for the design and construction of the Trinity River Vision project. We were tricked again in 2008 when we voted for a $150 million proposition for street improvements when the fine print indicated it was actually for the 3 bridges over dry land which still have not been constructed 10 years later.....yet TRWD claims their project is on schedule and on budget. Let's try not to let our City "leaders" trick us again! TRWD will be holding a series of public meetings to discuss this bond package. Please attend one or more of the public meetings (listed below) being presented by TRWD and ask some questions before you vote. What areas will this money protect from flooding? Where will these "drainage facilities" be located? Will the areas that flood now still flood after the project is completed? Where can voters see, in writing, what the money will be spent on? Where can voters find a full accounting of the project up to this point? Is it true the people were never allowed to vote for or against this project in the first place? Why not? It's a fact the Army Corp of Engineers never conducted a cost/benefit analysis of this project at its inception as Congresswoman Kay Granger asked the USACE to waive it and they did. Why was this standard procedure exempted at her request? Before we sink another $250 million more into this project, isn't it the time for the USACE to conduct a cost/benefit analysis to determine if the project is worth $250 million more? It's a fact the Congresswoman Kay Granger's son, JD Granger, is the project manager for Panther Island/TRV. What are his qualifications for this billion dollar project? Ask TRWD about JD Granger's recreational ideas such as FW 4th party, the wake board park, the skating rink, tubing in the Trinity River. Are these money-makers or costing us money? What do these activities have to do with flood control and drainage? Please ask questions and make an informed decision.....we owe it to our children and their future. On December 19, 2017, I took this picture and sent it to the City of Fort Worth's Storm Water Management Division.....if you look at your water bill, we pay some pretty hefty fees for storm water drainage fees. This is a photo of one of DR Horton's "retaining" walls located on the same property where DR Horton violated their Urban Forestry permit and destroyed over 100 mature, protected trees. The "retaining" walls are supposedly designed to promote effective drainage of storm water. I think the engineers may have underestimated the power of water. 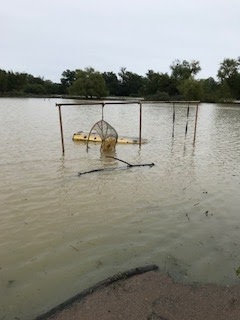 Despite the recently cleaned out drainage ditches on Randol Mill Road, the storm water drainage overflowed DR Horton's "detention" pond and covered Randol Mill Road which made it impossible for motorists to tell where the road ended and the drainage ditches began. Very dangerous and a huge liability for the City of Fort Worth. This is DR Horton's solution to their silt/sediment control problem. Rocks. What might be even more disturbing than DR Horton's solution to their storm water drainage problem is Fort Worth Storm Water Management Division's Assistant Director Greg Simmons' responses to my questions. 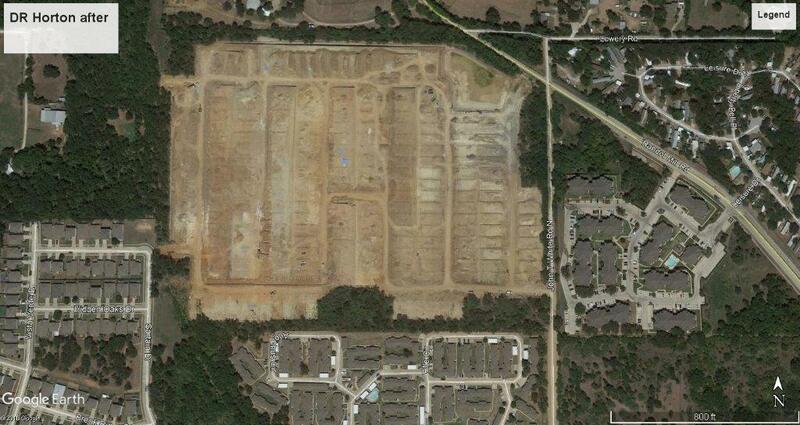 Were you aware DR Horton violated their Urban Forestry permit and removed more trees than they were allowed? "Yes. But, again, my e-mail wasn't about the permit." How is it even possible for developers to obtain permits AFTER they have already done their dirty deed? Who do I need to speak with about putting a stop to this? 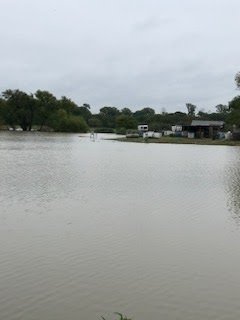 "With regard to drainage issues, situations where a property owner starts work without a permit are handled on a case-by-case basis with the goal of ensuring the ultimate goal of our regulations still is met even though they got ahead of themselves. I am not in a position to comment on how other Departments deal with such situations but I suspect it is similar." 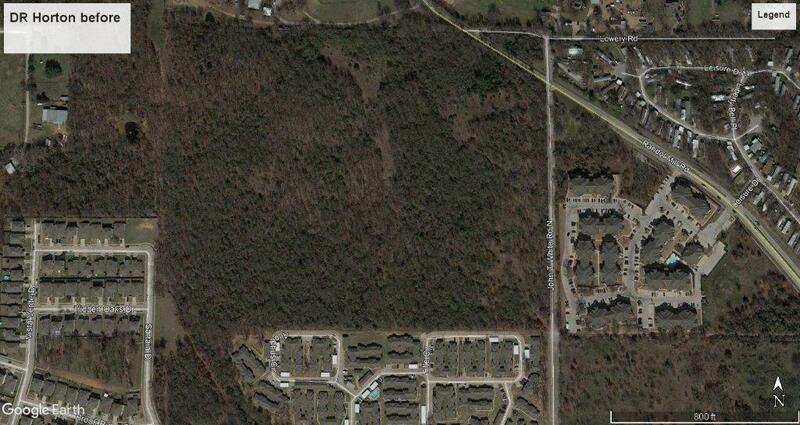 Did DR Horton's drainage plan reflect that they would be removing all of the trees they did? "Our drainage requirements, which are based on the regional standards, don't regulate tree removal and a developer's plan for leaving or removing trees has no bearing on their ability to meet drainage standards. The drainage plan is for us to verify that they have measures to mitigate additional flood or erosion risk regardless of the status of the tree stand, and there are ways to meet those standards with or without trees." What will the City do to require the developer to reconcile the differences in the plan they submitted to the City but deviated from? "The issues with their Urban Forestry Permit are not under my cognizance but I assume that the proceedings of the upcoming Urban Design Commission regarding this issue will answer this question." Strike 2 for DR Horton.....but they'll probably get a walk....FW is the umpire. Fort Worth: DR Horton's dirty tree deed. destroyed by DR Horton in the race to build more homes in Fort Worth. DR Horton is the greedy developer in this case. 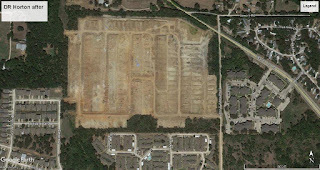 Ironically, DR Horton named this development Trinity Oaks, perhaps as a memorial to the over 100 trees DR Horton bulldozed down....in violation of their Urban Forestry permit. DR Horton destroyed more trees than they were permitted and got busted when a concerned citizen called Urban Forestry and complained (and no, it wasn't me). And in the typical Fort Worth Way fashion, the developer appeared before the Urban Design Commission in November 2017, after-the-fact, asking for a waiver of the requirement to preserve 25% of the existing canopy of trees they already destroyed. Fortunately for the citizens of Fort Worth who still value trees, the Urban Design Commission, expressed displeasure with what DR Horton did and asked a lot of questions DR Horton could not answer. The case was passed as a result and is reset for this Thursday, January 18, 2018 at 10 AM. What DR Horton did was unacceptable and we need to send a very clear message to DR Horton and other developers that destroying our trees won't be tolerated and there will be a consequence! DR Horton got greedy and cleared that land with the hopes of cramming as many single-family homes as they could on that property. If you are able to attend the Urban Design Commission meeting this Thursday at 10 AM, please do. If you cannot attend, please send an email to the Urban Design Commission letting them know you support what they do and share their displeasure with DR Horton. Ask the Urban Design Commission to require DR Horton to plant, at the very least, 5 times the deficiency as an effort to mitigate the loss of those 100s of mature, protected trees. It won't bring the trees back but it might teach DR Horton a valuable lesson by requiring them to give up some of their precious lot space to plant trees. Please send your email to laura.voltmann@fortworthtexas.gov and reference case # UFC 16-070.